Sea otters live in a cold ocean environment and rely on two traits to keep warm: a dense fur coat for insulation and very high metabolism to generate body heat. This metabolism needs to be continually stoked with energy in the form of food, and sea otters must consume as much as 25% of their body weight each day in order to stay warm and survive. Sea otters are carnivores that feed on an array of marine species—mostly invertebrates like crabs, clams, urchins, snails and worms. Their appetite for these invertebrate species exerts a strong influence on prey size and number and how they live and move in their habitat. Sea otters were hunted to near extinction during the maritime fur trade of the 1700 and 1800s. A population that once extended continuously along the North Pacific Rim was reduced to a few small remnant colonies. 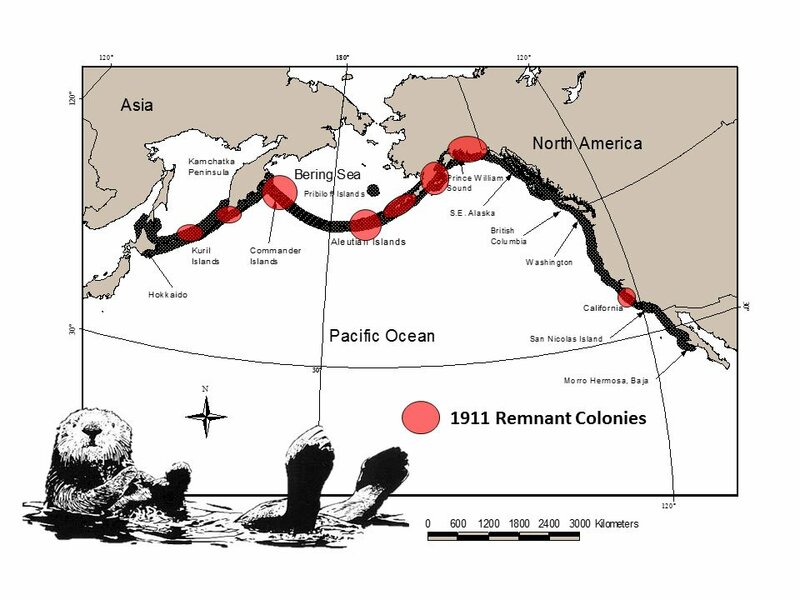 In the 1970s, a scientist named Dr. James Estes recognized that he could study the influence of sea otters on other species in their environment by comparing the coastal habitats in Alaska’s Aleutian Islands where sea otters had recovered to similar places where sea otters were absent. Dr. Estes found that the presence of sea otters had a dramatic effect on coastal habitats (see case study below). Since then, this kind of comparative study has been carried out in other parts of Alaska, Canada, Washington state, Russia and California. While scuba diving in the Aleutian Islands, Dr. Estes noticed places where the seafloor was covered with sea urchins and no kelp remained. Places that are overrun with urchins are known as “urchin barrens”. Sea urchins are herbivores and feed on seaweeds like kelp. 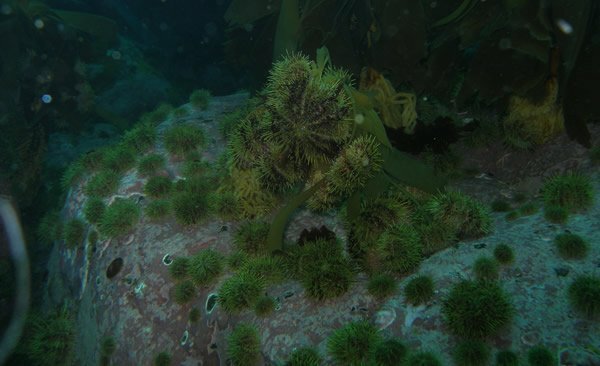 When urchins are uncontrolled by predators they become larger and more abundant, feeding on kelp until little remains. In contrast, Dr. Estes noticed that places with healthy sea otter populations often had healthy kelp forest habitat as well. 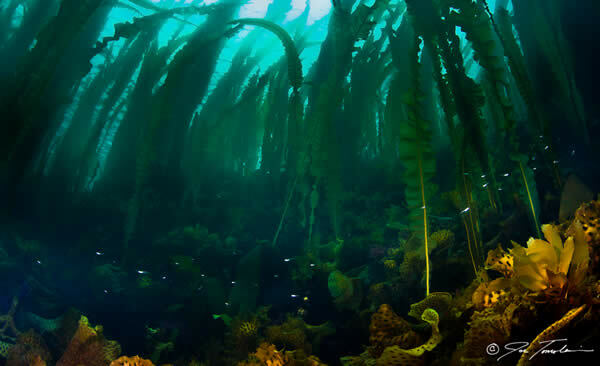 By controlling the size and number of sea urchins (sea urchins are one of their favorite foods, and they eat the larger ones first), sea otters created the opportunity for kelp to grow and flourish, which in turn created habitat for numerous other kelp forest dwellers. This type of relationship between a predator (sea otter), herbivore (urchin), and plant (kelp) is known as a trophic cascade. The complexity of trophic cascades can vary extensively from place to place, but this basic pattern is the foundation for understanding how sea otters fit into a healthy coastal environment. A new trophic cascade involving sea otters was recently discovered in a Central California estuary. 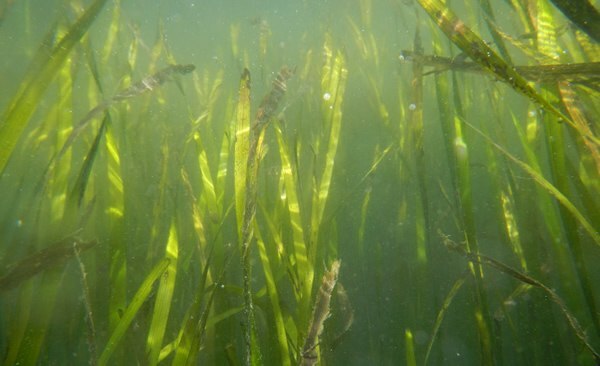 While studying the health of Elkhorn Slough, an estuary on Monterey Bay, Dr. Brent Hughes noticed that beds of eelgrass, an important component of many estuaries, were healthy there compared to other estuaries on the central coast. 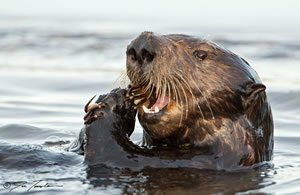 By studying how sea otters were foraging in the Elkhorn Slough—what prey species they were eating and where they were feeding—Dr. Hughes discovered that sea otters were feeding on crabs that in turn were feeding on sea slugs. The sea slugs’ grazing kept the eelgrass blades free from a smothering coat of algae. By controlling the number of crabs, sea otters helped sea slugs and other tiny marine grazers flourish. 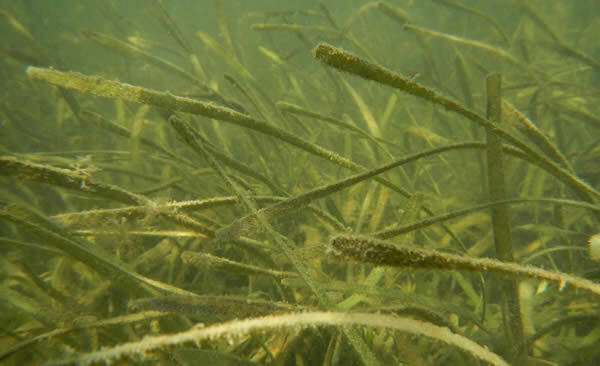 The grazers in turn kept the eelgrass blades clean and healthy. As sea otters reclaimed their role as predators in this estuary, they helped restore balance to this important habitat connecting land to sea.